In the previous Friday sermon, I read out an excerpt by the Promised Messiah (as), in which he said that the it was a time for the advent of the Messiah to reform Muslims as Muslims have completely distanced themselves from the essence of Islam, and they are absolutely unaware of the meaning and the purpose of Islam.” It is true that Muslims read the Kalima, observe the prayers, observe the fasting during the prescribed days of fasting and pay the zakat[obligatory alms]. The Promised Messiah (as) states, “I, however, say that all of their actions do not have the manner of righteous deeds. Otherwise, if these are righteous deeds, then why do they not produce pure results?” Today, we observe that the worst kind of disorder is found in Muslim countries, we observe that materialism is prevalent everywhere and people use the name of religion to further their own cause in politics and save their power. Can the state of Muslims today be that of those whom Allah the Exalted loves? Clerics –Him – are the ones who are creating the most disorder in the world. They have created a general state of fear, terror, disorder and corruption by issuing edicts of heresy against the one who has come from Allah the Exalted. Every day this allegation is levelled against the Promised Messiah (as) that he, God forbid, established the Jama’at in order to acquire and fulfil his worldly desires and in order to elevate his personal status. Nevertheless, we are aware that he was an ardent devotee of the Holy Prophet (sa) and that Allah the Exalted sent him in order to complete [the spread] of the Shari’ah of the Holy Prophet (sa). However, the practical state of Muslims these days, moreover, the practical example demonstrated by Allah the Exalted testifies to the fact that their condition is worsening. Countries are fighting with one another. Muslim countries are approaching and begging others to fight other Muslim countries. In the recent few days, the president of USA has once again announced that restrictions are being placed against Iran, and this is taking place contrary to the belief of the whole of Europe, the European Union and other countries are also against this decision. Even in the UK, a columnist has written that the entire world is against this decision by the President of the USA. However, there are three such countries that say that USA is acting appropriately. The USA itself is one of them, the second is Israel and the third is Saudi Arabia. Now, Saudi Arabia is granting permission to a non-Muslim country to wage war against a Muslim country. As a matter of fact, it is supporting it. Hence, these are the conditions of Muslims and exactly this is what the Promised Messiah (as) has depicted when he mentioned that the Muslims are divided. How then will they acquire the blessings of Allah the Exalted? 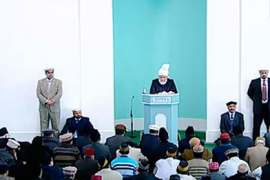 The Promised Messiah (as) continues by saying: “Your claim to have love for Allah the Almighty’ will only be proven authentic and complete if you follow the Holy Prophet (sa).” He says “It is clear from this verse that man cannot become God’s beloved and deserving of His nearness with any of his self-devised spiritual exercises and efforts. The Divine splendor and blessings cannot descend on anyone until a person is completely absorbed in the obedience of the Holy Prophet (sa). A person who loses himself in the love of the Holy Prophet (sa) and endures every type of sacrifice, receives the radiance of faith that liberates him from everything other than God and delivers him from sins and becomes a source of salvation. He lives a virtuous life in this world and is rescued from the narrow and dark graves of carnal passions. This is mentioned in a hadith, where the Holy Prophet (sa) has said: [Arabic text] I am the one to raise up the dead and they will be revived through me.” The spiritually dead are revived by the Holy Prophet (sa) and his followers become the beloved of Allah Almighty. Hence, those who are truly obedient raise the standards of their acts of worship. Every one of us should reflect on this and we must improve in this regard otherwise our claims of devotion and obedience will be hollow. And so firstly there is the hue of worship and secondly there is the hue of high moral standards. To be a true follower means to instil the moral characteristics within you that have been outlined in the Holy Quran. Therefore this is also why it is necessary for us to read the Holy Quran. Before we advise others, we need to assess our own condition that after accepting the Promised Messiah (as), to what extent have we made the Holy Quran our code of conduct and incorporated it into our Bai’at? To what degree do we remain steadfast on truthfulness and justice? To what extent do we make efforts to establish the rights of others? ‘Come unto me, all ye that labour and are heavy laden and I will give you rest.’ Jesus (as) also stated, ‘I am light’ and ‘I am the way, the truth, and the life.’ In other words, he stated that he is the light, one who shows the way and one who gives life, so they should come to him. Upon this the Christian scholar asked the question that did the founder of the Islam, the Holy Prophet (sa), ever speak of himself in these terms? On the one hand they claim to love the Holy Prophet (sa) and follow his commands, yet on the other hand, by accepting that the Messiah (as) is alive in the heaven they accept him to be superior. Thus, in this day and age, it is only the Promised Messiah (as) who defended the Islam and the Holy Prophet (sa) from every attack, as well as elevating his status. This was the purpose of the advent of the Promised Messiah (as), yet the [Muslim] clerics only raise allegations against him. Thus, due to complete obedience to the Holy Prophet (sa), God Almighty sent the Promised Messiah (as) in this era as the awaited Mahdi and Messiah. His status is that of a subordinate, non-law bearing prophet. The Promised Messiah (as) states: “When one loves God Almighty wholeheartedly over all worldly objects, and the grandeur and majesty of all beings other than God are removed from his heart – in fact he considers everything else to be akin to a dead insect – then God Almighty descends upon his heart with a great manifestation, just as if a clear mirror is placed before the moon, owing to the reflection of the moon it can be said metaphorically that the same moon in the sky is present in the mirror. In the same manner God descends upon that heart and makes that heart His throne. This is the reason why man has been created.” Thus, the Promised Messiah (as) was the complete devotee of the Holy Prophet (sa) and it is for this reason that God Almighty loved him and honoured him by declaring him to be the Promised Messiah and Mahdi as well as a subordinate prophet. Having accepted the Promised Messiah (as), may Allah the Almighty enable us to appreciate him and also enable us to become completely devoted to the Holy Prophet (sa). May he enable every single one of us to follow the example of the Holy Prophet (sa) according to our abilities and capacities, and may He enable the Muslims to accept and follow the ardent devotee of the Holy Prophet (sa).